By Randy Dwyer “If not us, who? If not now, when?” These questions have been posed by many over the years in an attempt to draw attention to causes both large and small. 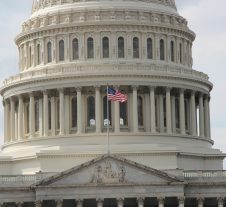 For Farm Bureau farmer and rancher members, the answers to these questions should hold more meaning today than ever before. “Classic Traditions, New Solutions” is the theme of the Jan. 18-20, 2019 Wyoming Farm Bureau Young Farmer & Rancher (YF&R) Conference in Sheridan, Wyo. The conference is geared towards young farmers and ranchers over the age of 18 (no membership necessary). Children are welcome. November 15, 2018— Tim and Dawn Pexton, of Converse County, were awarded the Wyoming Farm Bureau Federation (WyFB) Leadership Award at the organization’s 99th annual meeting. Presented Nov. 8, the award is given to those who have gone above and beyond in their agricultural leadership service in the organization. 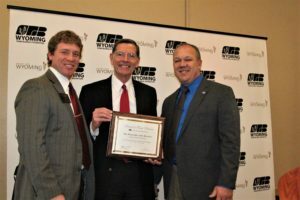 “Tim and Dawn’s leadership and dedication to the Farm Bureau Federation at the local, district and state level is unrivaled,” said Todd Fornstrom, WyFB President. Serving in leadership roles to represent farmers and ranchers is part of Tim and Dawn’s agricultural life. And it isn’t about the title either…wherever there is a need for leadership is where you will find them. Advocating for farmers and ranchers of all ages to join Farm Bureau and be a part of the voice for agriculture through membership in Farm Bureau has been an important component of their leadership. Fellow volunteers say Tim’s quiet and laid-back leadership style makes him an effective leader. Many will tell you he is a “doer” and not a “talker.” And Dawn’s support is unwavering. “Membership in Farm Bureau is valuable because it connects us to a lot of really great people who share the same goals and ideals, who face the same trials and tribulations, and who speak the same language. This is true at the local level as well as on a national level,” he continued. Some of Tim’s earliest memories are of attending Farm Bureau meetings where his Dad John served as county president, as well as other positions, and his Mom Noramae served as secretary and Women’s Chairman. Tim’s direct involvement began in the early 1970s. He and Dawn were married in 1979 and Dawn has attended nearly every annual meeting with Tim. Whether it be serving as county president or county membership secretary or serving as the co-pilot for one another on the long drives across the state to Farm Bureau meetings they are the epitome of leadership in Farm Bureau. Tim serves as the Central District Director on the Wyoming Farm Bureau Federation Board of Directors. He also serves as the Wyoming Farm Bureau Membership Committee Chair; a position he has held for 20 plus years. Tim’s involvement with the Farm Bureau Membership Committee was sparked by his Uncle Charles Pexton. Charles firmly believed in Farm Bureau and was not afraid to ask anyone, anywhere or anytime if they would consider paying their dues or to join if they weren’t already a member. Tim places high value in working to preserve and improve that system of membership acquisition and retention. In addition to Farm Bureau, Tim has volunteered and served on many boards including the “Fair Posse” in Converse County which supports the Wyoming State Fair. He has been active on the Eastern Wyoming College Foundation Board for the Douglas Campus. He served as chairman of the Wyoming Rural Development Council until its dissolution in 2016. His involvement in a Young Farmer Organization in his early years provided interaction and leadership opportunities including a couple of overseas trips to learn about agriculture in other countries. He has always been an avid supporter of Farm Bureau’s Young Farmer & Rancher program providing ideas and guidance. Tim’s love of Farm Bureau shows when he is mentoring new young members to get involved in the organization. Tim is a 4th generation rancher south of Douglas near Esterbrook. Their children are now married and have given Tim and Dawn four beautiful grandchildren with which they love to spend their time. The Wyoming Farm Bureau Federation is the state’s largest general agriculture organization. Members work together from the grassroots to develop agricultural policy, programs and services to enhance the rural lifestyle of Wyoming. On the web, www.wyfb.org. 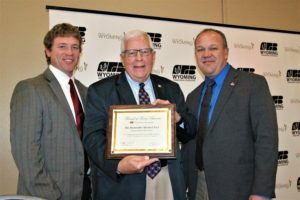 SHERIDAN, Nov. 9, 2018—Todd Fornstrom, of Laramie County, was elected to his third term as President of the Wyoming Farm Bureau Federation (WyFB) at the organization’s 99th annual meeting in Sheridan.